In the context of Taraka-yoga Mandala means a sphere. It's the sphere or levels of the disclosure of Universal Shakti. These spheres, also called the spaces, are experienced in the Akasha-chakra. Tapo-mandala. This level corresponds to Prakriti-pinda - the individual human body. It is perceived in the sushupti state. Teja-mandala. This mandala corresponds to Mahasakara-pinda, material universe, consisting of 5 Mahabhutas (5 Gross Elements). It's a Shiva's Cosmic Body and it has 8 manifestations, namely Shiva, Bhairava, Shrikantha, Sadashiva, Ishvara, Rudra, Vishnu, Brahma. Teja-mandala is experienced in the turya state. Jyoti-mandala corresponds to Adya-pinda, that is the basis of Mahabhutas. This level is realized during moving from turya to turyatita state of consciousness. 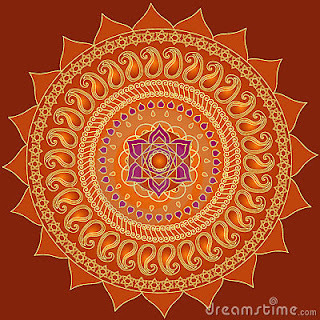 Parama-jyoti-mandala . This sphere corresponds to Anadya-pinda; this is the level of the realization or supreme bliss. Aparampara-jyoti-mandala is last, supreme mandala, that correspond to Para-pinda. This is a level of perception (or realization) of Ananta Brahman - nameless, formless, endless eternal Absolute. The perception of these mandalas means being in samadhi, when empirical personality is dissolved and there is no any more projection of the limited "I". In fact, the two last levels imply the state of liberation - moksha. Om Guru ji ko Adesh! © Yogi Lakshminath Maharaj. Ethereal theme. Powered by Blogger.